The proof is in the protein with Dr. Elsey's cleanprotein Chicken Formula Grain-Free Canned Cat Food. Inspired by the protein levels found in natural prey, this pate optimizes your cat’s appetite and body mass through simple, high quality ingredients. Including real chicken as the first ingredient, as well as nutrient-rich New Zealand green mussels, the idea is to promote a healthy and active lifestyle for all cats—because the right diet can go a long way in satisfying your cat’s appetite and keeping him feeling great. First ingredient is chicken for high levels of protein to promote a healthy body mass and a satisfied appetite. 100% grain, gluten and filler free in a smooth pate formula that’s full of vitamins and minerals like taurine. Chicken, Chicken Broth, Chicken Liver, Dried Egg Product, Natural Flavor, Salmon Oil, Agar-Agar, Tricalcium Phosphate, Barley Grass, Choline Chloride, Potassium Chloride, Salt, Taurine, Turmeric, Dried New Zealand Green Mussels, Zinc Proteinate, Iron Proteinate, Magnesium Proteinate, Niacin Supplement, Vitamin E Supplement, Copper Proteinate, Sodium Selenite, Thiamine Mononitrate, Manganese Proteinate, Vitamin A Supplement, Calcium Pantothenate, Riboflavin Supplement, Pyridoxine Hydrochloride, Biotin, Vitamin D3 Supplement, Vitamin B12 Supplement, Ethylenediamine Dihydroiodide, Folic Acid. For Adult cats, feed 1 can for every 6 - 8 lbs of body weight per day. Kittens require up to 2 and a half times this amount. For pregnant and lactating females, feed up to 3 times the normal Adult amount per day. Adjust the amount of food you serve based on the age, size and activity level of your cat. Food should be fed at room temperature. I love the protein based idea of this cat food. However, this product contains Salmon Oil and although it has many health benefits, past experience giving my cats the tiniest drop of Salmon oil mixed into their food was poorly received. One cat cannot stand the oiliness on his tongue and the other can smell it a foot away and refuses to come any closer. If Dr. Elsey should ever make a cat food devoid of Salmon Oil we would gladly give it a try. PC our very picky eater that has digestive problems. Loves the Chicken! For a kitty that almost died from other foods. We are very Thankful and appreciate Dr. Elsey! Unfortunately, I think my cat would give this one star if he could. Things looked promising with the first couple of cans, but after a couple more I can barely get him to touch it even with toppers. He'll take a couple of bites then he walks off and I'm left to throw most of the food away. I like the ingredients though, and the price isn't bad, so I'd still recommend to anyone looking for a good, low carb cat food. My boy just isn't a fan. I was hoping my cat would like this food. I had a coupon so figured I'd give it a try. I was looking for a good quality high protein food that would keep him satiated and maintain his weight. He grudgingly ate a few bites at each feeding over a week's time. Most of it sat in his bowl unfinished for the day. 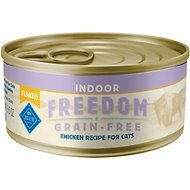 This food was recommended to me by the veterinarian I work with (I’m a technician) and my cat just loves it. It’s very low in carbs and high in protein, exactly what we look for in a canned food. I have 3 cats; 2 drop offs and one Tonkinese. All hate this perfectly nice food. I am very disappointed. I have tried it twice with identical results of them eating around this new food to only eat bits of other foods I've included. Can I return this? Really wish the cats would eat it! We have senior cats with kidney disease and they were both losing weight. They refused to eat the prescription food so our Vet recommended Dr. Elsey's instead. While neither cat loves the food they will eat it -- their fur feels healthy and their overall energy is good. I'd recommend checking with your Vet before switching your cat over to this, but if the Vet approves it I'd highly recommend this food. I bought this pate-style food after reading a cat expert's blog in which she stated she feeds her cats this high-quality food. It was also in her top 10 list. My lil' chubbs loves it, but my two boys are "meh." They'll eat a small portion and leave the rest, which I then give to my chubbs and she gobbles it up. So, it's a hit-or-miss game. I can only vouch for the quality. Good healthy ingredients, nothing bad or questionable, and cats like it. It's a super soft pate, almost like a mousse. So it's good for cats that might have trouble chewing.